Kent's "Hooligan Libertarian" Blog: "Gun Free Zone"
I hate "gun free zones". For one thing, they only apply to people who have no intention of murdering or robbing. 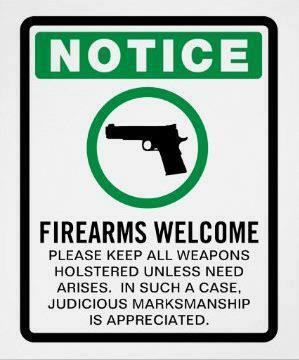 A true "gun free zone" is one that is administered by some government entity. Since government is prohibited from passing or enforcing any "laws" concerning guns, these "zones" have no authority or "legal" basis whatsoever. And certainly no ethical foundation. You are not a bad person nor a trespasser if you ignore their edict. That doesn't mean there may not be consequences- so, be smart. Private "gun free" zones are a slightly different matter, but no "better". I don't believe we would see very many private "no gun" signs had not the government previously made it appear acceptable to prohibit decent people from carrying guns in certain areas. There is almost no place where there is a legitimate justification to prohibit guns. Some place where a shot fired could cause an explosion is about the only one. Most gun bans are based upon touchy-feely emotionalism. Or a backwards fear of liability. Now, anyone can be a pig-headed idiot and be "afraid" of people who are taking responsibility for their own safety, but seriously, if you don't trust someone with a gun, why do you pretend to trust them at all? Because if you say you do trust them, just not with a gun, you are lying. Yes, you have a right to prohibit people from coming onto your property for any reason, or no reason at all. But sometimes you are wrong to do what you have a right to do. Sorry, but that's just how it is. You have a right to prohibit Jews, or homosexuals, or blondes, or left-handed men, or people wearing green shirts from coming onto your property, but by doing so you expose yourself as a bad person who is subject to shunning. And if someone comes on to your property and is harmed by an otherwise preventable act of violence while they were disarmed at your insistence, I would hold you liable if I were arbitrating. Just as I would hold them liable if they came onto your property and, by an act of carelessness or willful destructiveness, caused bodily harm or property damage. I don't trust people who don't trust me to be armed. I suspect their motives. If you're unable to distinguish between "agreed to certain terms in return for some good, service, access" and "an act of carelessness or willful destructiveness," you should probably refrain from offering arbitration services, for the simple reason that offering them would constitute the latter. In which case I will gladly agree to face arbitration myself.